The junior had 71 receptions last season, the most among FBS running backs and the most ever for a WSU running back. James Williams knows he will never get the same number of rushing attempts as Stanford’s Bryce Love or Washington’s Myles Gaskin. That’s just a fact when you are a running back in Washington State’s pass-happy offensive system. But that is fine with Williams, a 6-foot, 205-pound junior who is the Cougars’ top returning running back. He doesn’t have to be handed the ball to make an impact. 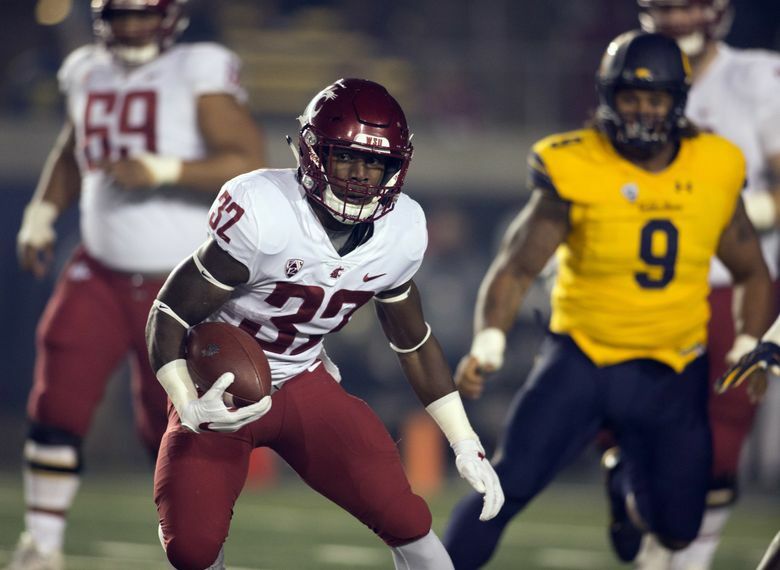 Williams had a team-high 92 rushing attempts last season for 395 yards, and he also had a team-high 71 receptions, the most by any running back in the FBS and the most-ever for a Cougars running back. Williams knows there are going to be games where he gets only a few carries. Last season, Williams competed for playing time with then-seniors Morrow (who led the team in rushing last season with 522 yards) and Gerard Wicks. Williams said the big difference now is that he is a veteran of the unit, which includes senior Keith Harrington and touted true freshman Max Borghi. Williams said his goal this season is to get 1,000 combined yards rushing and receiving. As a freshman, he had 926 (584 rushing and 342 receiving) and he had 877 last year (395 rushing and 482 receiving). But what does he like best, getting handoffs or catching the ball? That one is a tough call. Williams, who redshirted his first year after starring at Burbank (Calif.) High School, said it is “crazy” how fast time has flown for him at Washington State. Williams said he isn’t listening to any of the predictions that say the Cougars could take a downward turn after losing so many key pieces from the team that went 9-4 last year. As for himself, he said he wants to improve everything he does, which must be a scary thought to opponents.